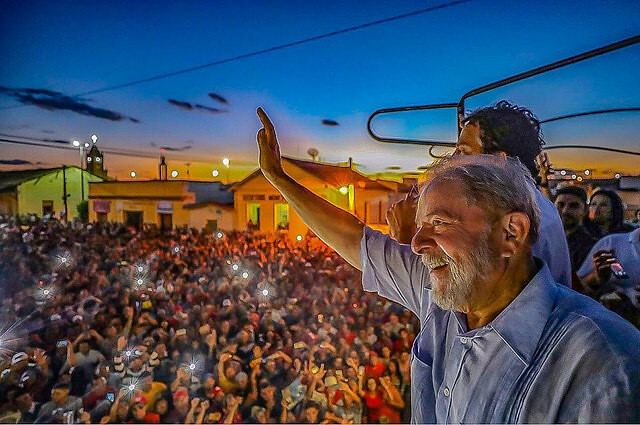 Brazil’s ex-president Luiz Inácio Lula da Silva released a manifesto to the Brazilian people during the launch of his presidential pre-campaign. Also a former president and Lula's fellow party member Dilma Rousseff read Lula’s letter last Friday (8) in the city of Contagem, Minas Gerais. The former president has been in prison for two months. “It is to end the suffering of the people that I am again running for President. […] I know that my candidacy represents hope, and we will take it to the final consequences, because we have the strength of the people at our side,” Lula wrote. “From where I am, with the solidarity and energies that come from all corners of Brazil and the world, I can assure you that I will continue working to transform our dreams into reality. And so I am preparing, with faith in God and a lot of confidence, for the day when I will once again unite with the beloved Brazilian people,” he added. For two months now, I have been unjustly incarcerated without having committed any crime. For two months I have been unable to travel the country I love, bringing the message of hope of a better and more just Brazil, with opportunities for all, as I always did during 45 years of public life. I was deprived of my daily life with my sons and my daughter, my grandsons and granddaughters, my great-granddaughter, my friends and comrades. But I have no doubt that they have put me here to prevent me from being with my larger family: the Brazilian people. This is what distresses me the most, because I know that outside, every day, more and more families are back to living in the streets, abandoned by the State that should protect them. From where I am, I want to renew the message of faith in Brazil and in our people. Together, we have been able to overcome difficult times, serious economic, political and social crises. Together, under my government, we overcame hunger, unemployment, recession, the enormous pressures of international capital and its representatives in the country. Together, we reduced the age-old disease of social inequality that marked Brazil’s formation: indigenous genocide, the enslavement of blacks and the exploitation of the workers of the city and the countryside. We fought injustice tirelessly. With our heads held high, we have come to be considered the most optimistic people in the world. We have deepened our democracy and we have gained international prominence with the creation of Unasur, Celac, BRICS and our relationship of solidarity with African countries. Our voice was heard in the G8 and in the most important world fora. I am sure we can rebuild this country and dream, once again, like a great nation. That’s what keeps me fighting. I will not settle with the suffering of the poorest and the punishment that is falling on our working class, just as I will not settle with my situation. Those who accused me in Lava Jato know that they lied, because I never owned, never had possession, nor spent one night in the Guarujá apartment. Those who condemned me, Sérgio Moro and the TRF-4 judges, know that they set up a judicial farce to arrest me because I was able to prove my innocence in the case and they were not able to present proof of the crime that they accuse me of. To this day I ask myself: where is the proof? I was not treated by the prosecutors of Lava Jato, Moro and TRF-4 as a citizen equal to everyone else. I have always been treated as an enemy. I do not cultivate hatred or hold any grudge, but I doubt my executioners can sleep with a clear conscience. Against all injustices, I have the constitutional right to appeal out of jail, but this right has been denied to me so far, for the sole reason that my name is Luiz Inácio Lula da Silva. That is why I consider myself a political prisoner in my country. When it became clear that they were going to take me in by force, without crime or evidence, I decided to stay in Brazil and face my executioners. I know my place in history and I know the place reserved for those who persecute me today. I am sure that Justice will make truth prevail. In the caravans I recently took part in, along Brazil, I saw hope in people’s eyes. And I have also seen the anguish of those who are suffering with the return of hunger and unemployment, malnourishment, school dropout, rights robbed from workers, destruction of the constitutionally guaranteed policies of social inclusion, that are now denied in practice. It is to end the suffering of the people that I am again running for President. I take on this mission because I have a great responsibility with Brazil and because Brazilians have the right to vote freely for a project of more solidarity, a more just and a sovereign country, persevering in the project of Latin American integration. I am a candidate because I sincerely believe that the Electoral Court will be coherent with its judicial precedents, since 2002, not bowing to the blackmail of exception only to hurt my right and the right of voters to choose who represents them best. I ran many times during my career, but this race is different: it is my life’s commitment. Those who had the privilege of seeing Brazil advance on behalf of the poorest, after centuries of exclusion and abandonment, cannot sit out during the most difficult time for our people. I know that my candidacy represents hope, and we will take it to the final consequences, because we have the strength of the people at our side. We have the right to dream again, after the nightmare that was imposed on us by the 2016 coup. They lied to overthrow the legitimately elected President Dilma Rousseff. They lied saying that the country would improve if the Workers’ Party was ousted from government; that there would be more jobs and more development. They lied to impose the program that was defeated at the polls in 2014. They lied to destroy the project of eradicating misery which we put in place under my government. They lied to give away the nation’s wealth and to favor the economic and financial powers, in a scandalous betrayal of the people’s will manifested clearly and unequivocally in 2002, 2006, 2010 and 2014. The hour of truth is coming. I want to be president of Brazil once again because I have already proved that it is possible to build a better Brazil for our people. We proved that the country can grow for the benefit of all when the government places the workers and the poorest at the center of the concerns, and does not become a slave to the interests of the rich and powerful. And we proved that only the inclusion of millions of poor people can make the economy grow and recover. We govern for the people and not for the market. It is the opposite of what the government of our opponents, at the service of financiers and multinationals, who abolished the historic rights of workers, reduced real wages, cut off investments in health and education, and is destroying programs like Bolsa Familia, Minha Casa, Minha Vida, Pronaf, Luz Para Todos, Prouni and Fies, among many actions aimed at social justice. I dream of being president of Brazil to end the suffering of those who do not have money anymore to buy gas, who now have to use wood for cooking or, even worse, use alcohol and become victims of serious accidents and burns. This is one of the cruelest setbacks caused by the policy of destruction of Petrobras and of our national sovereignty, led by PSDB supporters who backed the 2016 coup. Petrobras was not created to generate gains for Wall Street speculators in New York, but to ensure oil self-sufficiency in Brazil at prices compatible with the popular economy. Petrobras must be Brazilian again. You can be certain that we are going to end this tale of selling its assets. It will no longer be hostage to oil multinationals. It will once again play a strategic role in the country’s development, including in directing the pre-salt resources to education, our passport to the future. You can also be sure that we will prevent the privatization of Eletrobrás, Banco do Brasil and Caixa, the emptying of the BNDES and of all the tools available to the country to promote development and social welfare. I dream of being the president of a country where the judge pays more attention to the Constitution and less to the headlines. Where rule of law is the rule, without measures of exception. I dream of a country where democracy prevails over anyone’s discretion, media monopoly, prejudice and discrimination. I dream of being the president of a country where everyone has rights and nobody has privileges. A Country where everyone can have three meals a day again; where children can attend school, where everyone has the right to work for dignified wages and with the protection of the law. A country in which every rural worker has again access to land to produce, with finance and technical assistance. A country where people will once again have confidence in the present and hope for the future. And where for this very reason is once again respected internationally, promotes Latin American integration and cooperation with Africa once again, and exercises a sovereign position in the international dialogues on trade and the environment, for peace and friendship amongst peoples. We know the way to carry out these dreams. Today it goes through the holding of free and democratic elections, with the participation of all political forces, with no rules of exception to prevent just one candidate. Only then will we have a government with legitimacy to face great challenges, that can dialogue with all sectors of the nation supported by the popular vote. It is this mission that I am taking on by accepting my nomination as presidential candidate of the Workers’ Party. We have demonstrated already that it is possible to make a government of national appeasement, where which Brazil walks in the direction of the Brazilians, especially the poorest and the workers. My government was one where the poor were included in the Union’s budget, with more income distribution and less hunger; with more health and less child mortality; with more respect and affirmation of the rights of women, of blacks and of diversity, and with less violence; with more education at all levels and fewer children out of school; with more access to universities and technical education and fewer young people excluded from the future; with more popular housing and fewer occupancy conflicts in the cities; with more settlements and land distribution and fewer conflicts of occupation in the countryside; with more respect for the indigenous populations and quilombolas, with more salary gains and guarantees for the rights of workers, with more dialogue with unions, social movements and business organizations and less social conflicts. It was a time of peace and prosperity, as we have never had before in history. I believe, from the bottom of my heart, that Brazil can be happy again. And it can advance much more than we had already conquered together, when the government was of the people. In order to achieve this goal, we must unite the democratic forces of all Brazil, respecting the autonomy of the parties and the movements, but always having as reference a project of more solidarity and a fairer Country that will rescue the dignity and hope of our suffering people. I am sure we will be together at the end of that path. From where I am, with the solidarity and energies that come from all corners of Brazil and the world, I can assure you that I will continue working to transform our dreams into reality. And so I am preparing, with faith in God and a lot of confidence, for the day when I will once again unite with the beloved Brazilian people. And this reunion will not happen only if my life is lacking. See you soon, my people. Long live Brazil! Long live Democracy! Long live the Brazilian people! Brazil: Could Lula run for president from prison?